Yes, we know its short story week – so why are we reading poetry? – because this is narrative poetry – it tells stories! Readings from Arachne Poets featured in The Other Side of Sleep: Anne Macaulay, Inua Ellams, Jennifer A McGowan, Bernie Howley. 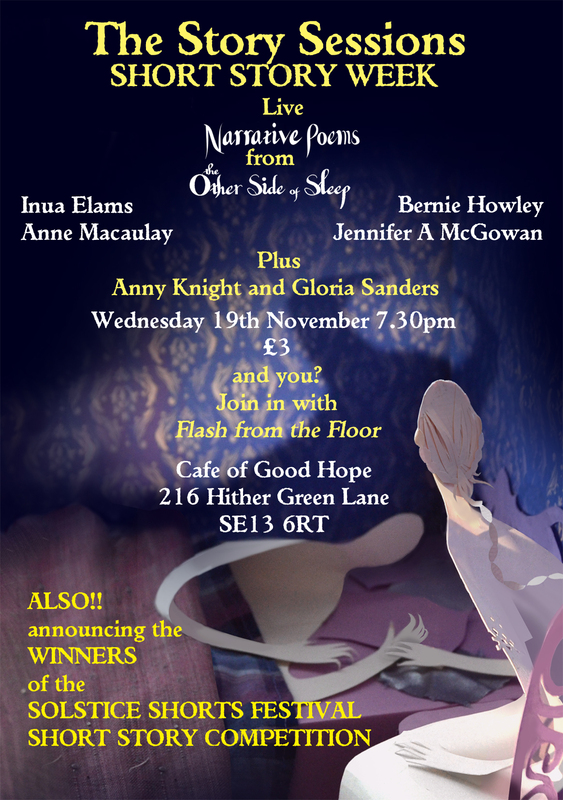 Also reading but not in the book: Anny Knight and Gloria Sanders and hopefully a couple more poets,including you? Join in with flash from the floor. PLUS! We will be announcing the WINNERS of the SOLSTICE SHORTS FESTIVAL SHORT STORY COMPETITION. This entry was posted in competitions, join in, live literature, poetry, readings, Solstice Shorts, Story Sessions and tagged Anne Macaulay, Anny Knight, Bernie Howley, Gloria Sanders, Inua Elams, Jennifer A. McGowan, Narrative Poetry, National Short Story Week, Solstice Shorts Festival, The Other Side of Sleep, The Story Sessions, Winners Announced by Cherry Potts. Bookmark the permalink.